Buying sunglasses or eyeglass online can be tricky because there are so many counterfeit products. The next paragraphs will explain to you how you can protect yourself from buying fake Chrome Hearts eyewear. The authentic Chrome Hearts eyewear in most cases comes with accessories CH book, CH guaranty, case and cloth. 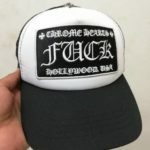 If you have in your package a CH book it should be with a three-dimensional logo of Chrome Hearts or in another word should be convex and you could feel the letters. If there is not a feeling or look of three dimensional and more like sticker this mean that your CH book is fake counterfeit and probably your sunglasses or eyeglass are also. The main difference between fake and real Chrome Hearts case. Even the fake case is made very well. They have a same size, texture and in most cases for the untrained eye will look identical. Unfortunately, there is one big difference most of the Chrome Hearts fake case is made from a sort of plastic faux leather but this is only figuring out when you see it inside and also you should know how real leather look like. Inside the case has a small punch bag there you can spot the difference. Chrome Hearts eyewear has and Sterling Silver ornament. All of the metal ornaments on the Chrome Hearts sunglasses or eyeglasses are made from precious metals (Silver, Sterling Silver, Gold). If you match some of the other clues explained above you should prepare your glasses for testing. Scratching yours glasses parts for testing should be the last step and in most cases will be an unwanted step but if it is necessary you should choose best place to do it. One of recommendation is to disassemble any possible part and take a sample from inside. Like that you will not damage or scratch the visible side of the element.